While Instonians claimed a vital four points to ease clear of any relegation trouble yesterday, it was a different story for the Shaw's Bridge side on Saturday as they conceded 284 to Civil Service North. The second string Instonians attack were clinically taken apart by CSN professional Andre Malan and the Challenge Cup finalists then bowled out Instonians for 163. Malan came to the middle when Mark Ellison was caught behind off Shane Getkate from the second ball of the match and was still there when CSN's 50 overs were up, 130 not out (16 fours and a six). In reply, only Andrew White put up serious resistance and that came to an end with 37 to his name. The result of the day came at Middle Road, where Carrickfergus sent Waringstown to their second defeat of the season - the other came on the opening day of the season, at home to Carrickfergus! The champions were handicapped by the absence of Adam Dennison in his normal opening batting spot after he dislocated a finger taking a boundary catch. After a visit to hospital he returned to the ground to find Waringstown 73-6, in reply to Carrick's 218-9. Kyle McCallan attempted a rescue act - he finished top scorer with 38 - but Dennison was last man out caught by Alex Haggan, ironically the player he had dismissed when injuring his finger, as the Villagers were bowled out for 155 in the 47th over. Jamie Holmes, dominated the Carrick innings with 78 from 71 balls - the next best score was 27 - but once Haggan had dismissed James McCollum and James Hall after an opening stand of 42, the rest of the top six folded meekly and Carrick never lost control. CIYMS took advantage of their rivals' slip-up to ease clear at the top of the table with a 10 wickets thumping of North Down, Chris Dougherty (77) and John Matchett (70) reaching their target of 156 in the 27th over. Alistair Shields scored 56 for North Down but from 87-1, the introduction of James Cameron-Dow (3-32) and Jacob Mulder (4-20) hurried the innings to a conclusion. Armagh posted their highest score of the season on Saturday but still lost by 55 runs to Muckamore for whom Fahad Iqbal (77), Jamie Magowan (72 not out), Aditja Adey (72) and Adam McDaid (51) all scored half-centuries in the visitors' 308-7. McDaid had taken to the NCU like a duck to water after his sudden move from Eglinton. 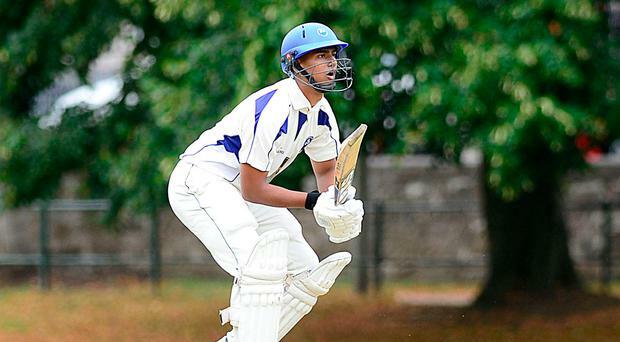 After scoring 61 on his debut the previous weekend against CSN, he hit 11 fours in his in his 55-ball innings to set up Muckamore's imposing total which despite the efforts of Shadley van Schalkwyk always looked out of reach. The South African scored 142 (16 fours and two sixes) but only two other players reached double figures. Just as impressive for Muckamore was Emerging Knight Adey who was hit on the helmet by van Schalkwyk but two balls later hooked him for six!